Click here for a letter from a client who got her dream job after working with Kristina. Aligning your work with your Essential Self and unique talents and abilities creates a sense of peace and calm that allows for internal healing to permeate every aspect of your life. Discover your unique gifts and talents, and receive practical solutions as to how best you can use them in your personal or professional life. Regardless of where you are at in your career/life path, Kristina will put things in perspective, help you understand the cycle you are in and allow you to gain clarity, focus and direction. Initial in-depth one-on-one consultation includes a two-hours session (in person or on the phone) and one 60 minute follow-up consultation by phone. An ongoing way for you to gain clarity, keep balanced and be supported in your personal growth process. Includes three in-person 90-minute sessions. Includes three one-hour sessions over the phone. For those who are looking for a monthly check-in, this includes six 90-minute in-person sessions, one 60 minute phone session and one free Thursdays at Three or Tuesday Talk group session and weekly email access. Kristina is also available for 60minute phone consultations. This is a monthly gathering of those who are currently employed, are in career transition, or are considering a change and would like to experience support, networking and guidance along the way in the areas of career and work/life balance. Each attendee will receive at least 15 minutes of personalized coaching in a group setting per session. *Special Rates available for TWM Members, NYWICI Members, recent grads, long-term unemployed and veterans on some options. Contact Kristina for more details. Please note: Once you meet with Kristina one-on-one or in a group session, you are then on her radar and will receive additional benefits and perks as a result (i.e. job postings, event invitations, networking connections etc…)! 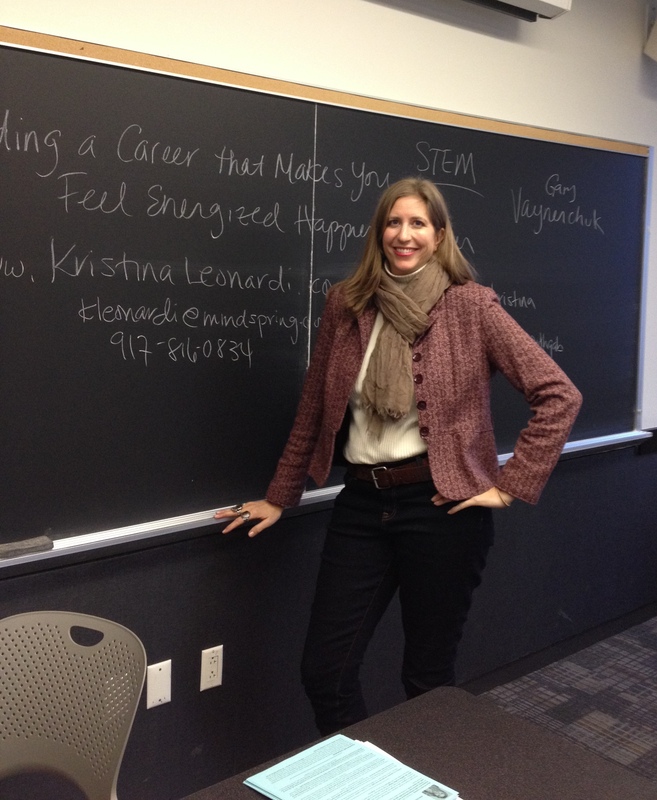 “Kristina is an impressive and talented career coach. She is incredibly insightful, encouraging and exudes a positive energy that really helps get results in stressful times. I can highly recommend her to anyone looking for career guidance of any level.” – Sascha Y. “I had just lost my job a few weeks earlier and I was a little out of sorts. I attended Kristina’s breakout session entitled “How Losing Your Job Can Be a Good Thing”. After listening and actively participating in the session, I was really able to put things in perspective. It allowed me to dig deep within myself and really determine what I wanted to do with my life. After the conference, I decided to have a one on one coaching session, which helped validate my career goals, and have also attended her Thursday at Three Transition Group meetings. Kristina is truly an inspiration and I recommend her to anyone who is feeling a bit lost and needs some career and life counseling.” – Justin S.
“Kristina has a special gift for helping people find their way in their careers and life. She has a sick sense about people and always made me feel better when I was stuck. She combines the perfect combination of intuition and career smarts in her sessions. Her support group has been life changing and instrumental in propelling me forward.” ~ Ilana A. “Kristina helped me during a time of hardship in my life. I had just been diagnosed with a hip stress fracture, and being an endurance athlete, my spirits were murky to say the least. She helped me see clarity, which to this day, I still use and feel comforted by. I read the books she recommended and listened to her advice about not giving up and finding creative ways to fulfill my destiny. It’s an understatement to say she has affected me in a positive way. After her consultation seven months later, with the help of her healing, I even ran another marathon and started a new promising career.” -Victor E.
“I first learned of Kristina’s work through her nonprofit organization, the Women’s Mosaic. I have never worked with a career/life coach before but after reading about her mission and achievements, I felt compelled to schedule a consultation. She immediately made me feel comfortable and understood my needs. She taught me how to stay focused on my personal goals and offered solid advice. I value her opinion and believe she is committed to helping others reach their full potential. I particularly enjoy her inspirational “Personal Growth Gab” e-mails. Kristina is a valuable resource and I highly recommend her as a talented coach.” – Joy S.